Innovatrics was founded upon the spirit of innovation. We thrive on difficult challenges. We listen to our customers, we understand their challenges and we create innovative solutions. When we began in 2004, our algorithm could match a few thousand records per second. Continuous innovation has helped it become the industry leader in speed, accuracy and interoperability. Innovatrics consistently ranks among the best in the world in biometric benchmark evaluations and certifications including: NIST MINEX III, NIST FpVTE, NIST FRVT, NIST PFT II and many more. Speed is in our DNA. Our fingerprint matching algorithm is now the fastest in the world with a matching speed of 1.04 billion per second on a standard server. 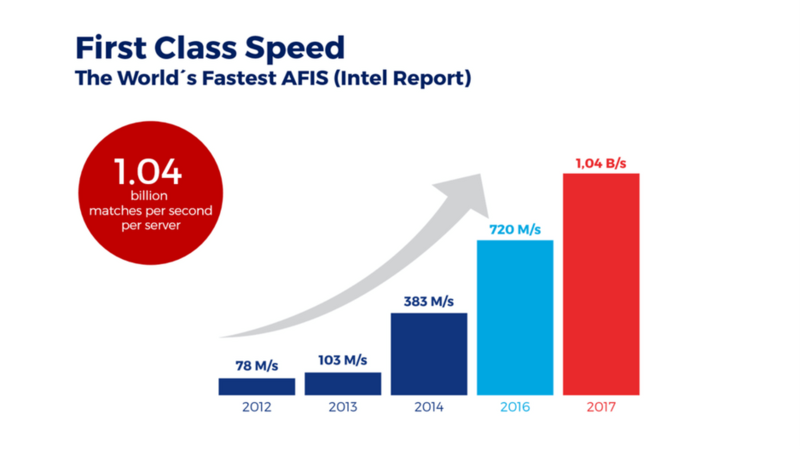 Continuous innovation has helped us achieve this blazing performance, ensuring that we have stayed ahead of our competitors and that our unique algorithm continues to underpin the fastest AFIS solution available on the market. We are not just leading innovators in the area of fingerprint biometrics; our facial recognition technology is also a top performer. Continuous development of our algorithm, combined with innovations such as newly introduced GPU acceleration support means our facial technology is now capable of performing thousands of facial template extractions per second. As well as underpinning our fingerprint and face technologies, our culture of innovation and passion for challenges drives our research and development in other biometric modalities. Matching speed is a key factor for large-scale projects with multiple millions of enrollees. A high-performance algorithm means less servers are required to support the solution, while maintaining high throughput and very low latency. This results in greatly reduced response times, real-time identification and significant cost savings, especially when we consider very large systems with more than 100 million enrollees. Speed is important, but accuracy is critical. We don’t compromise. Without accuracy, speed is irrelevant. From the very beginning, our algorithm has delivered stunning accuracy to our solutions. The founders of Innovatrics’ first mission was to fix biometrics and to make biometric technology practical and reliable. By focusing on quality, investing in the smartest people and exploring new areas of deep learning, we’ve managed to achieve industry-leading accuracy. Not only have we fixed the issues associated with biometrics – we’ve revolutionized the technology. The industry-leading accuracy rate of our algorithm (99.98%), when deployed in a biometric identity management solution, results in dramatically lower error rates and greatly increased security and convenience. It also results in better performance in latent prints / poor quality image matching, enterprise 1:N identification (with only 1-2 fingers), hard to recognize prints / edge cases and enhanced performance on platforms with limited features (mobile & embedded). Innovatrics’ industry-leading accuracy, identification speed and enrollment (extraction) speed, combined with agile design and low RAM consumption, mean our technologies are first in the world in operational ranking. Our technology consistently achieves top results in interoperability evaluations. Interoperability is critical in large biometric authentication projects. Many large biometric authentication systems in government agencies, financial institutions or large organisations are based on the rudimentary requirement of fingerprint template interoperability. Our vast experience has helped us to ensure that our fingerprint templates enable every certified matcher to gain maximum accuracy, and our template matcher delivers first class accuracy with every interoperable fingerprint template. We don’t bind our customers to any kind of hardware or software. We have designed our biometric technologies to be ready to run on a broad range of hardware and software platforms, meaning customers don’t need to worry about compatibility issues. The biometric solution you select today must be able to integrate with the technologies of tomorrow. We are able to port our components and libraries also to unusual platforms and those with limited computing power and memory. Be it fingerprint matching, face detection and tracking or face matching, there are no limitations for you in choosing your preferred hardware or software platform. For over a century, fingerprints have been the foundation of identification. This is especially true when it comes to keeping track of criminals within a society. People leave their fingerprints everywhere thanks to the oils that are on their hands. These fingerprints can be dusted, recorded, digitally analyzed, and compared to all other fingerprints that have ever been stored. With the millions and millions of fingerprint records that have been analyzed, no two duplicate fingerprint patterns have ever been recorded. How our algorithm processes the biometric data from fingerprints? Don´t miss anything! Sign-up to our newsletter.